HL Overtaken was out of the first calf crop we ever branded at Hudson Longhorns way back in 2003. 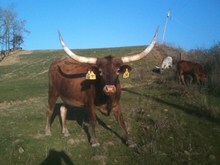 She has an old-time classic look for a Longhorn cow. A real beauty with a ton of total horn shaped like goal-post. She is a real sentimental favorite of ours and a cow that we will never sell. She is 15 years old and still a very productive cow. She gave us a real nice 2017 heifer and she is bred back to WS Vindicator for what promises to be her best work yet.